Mrs. Yollis' Classroom Blog: November is Family Blogging Month! November is Family Blogging Month! Each student made a list of their family members. After looking through the archive, students selected specific posts tailored to the interest of a particular relative. We're inviting everyone to comment: moms, dads, brothers, sisters, grandmothers, grandfathers, uncles, aunts, and cousins. Students will be inviting their family and friends to participate in a conversation! Maybe we'll get some 2-point comments! If you don't know what to say, here is a video made by Mrs. Yollis' third graders. 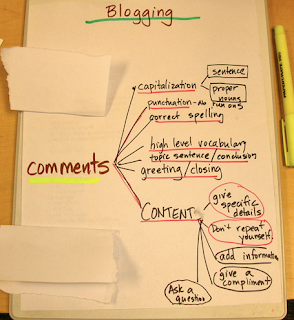 Learn FIVE tips for writing a quality comment! If you don't know How to leave a comment, here is a video tutorial about HOW to leave a comment on our blog. Here is the key we will use for Family Blogging Month. What do you think of our idea? Who are you inviting to be a part of our online community? Please leave a comment and introduce yourself! I am going to have fun with this blogging project. My parents will love to blog. This activity is going to give me a good experience about blogging so much. My family members will love this to. I think you will have fun with Family Blogging Month! It is a wonderful way to practice our literacy skills of reading and writing, However, it is also a terrific way to learn about others and build community. Do you know what I mean by that? I am happy you commented back to me. I think I know what you mean in your question. I think you mean we see how everyone is different. That is just my opinion. I also think that when you start a conversation with someone you get to know them better. How did you come up with Family Blogging Month? Did you come up with this great project? I hope you get the chance to comment back to me. Then we could start a conversation! I think that I will jump right in to this conversation and say hello! Family blogging month is such a great idea. Thank you for including me in your class project. This is a fun way to communicate and stay in touch. It is very late here, and I have to go to sleep now. I live in a different time zone. Do you know what time zones are and how many of them are in the United States? I look forward to reading your answers. Oops, I forgot to sign my comment before I pressed the 'enter' button. P.S. I have a nickname. It's a short form of my whole first name. I wonder how many people here go by nicknames, too? I am so exited you could be part of Family Blogging Month! This is a fun experience and I hope you will enjoy it as much as I do. There are three time zones in the U.S.A: Eastern time zone, central time zone, and Western time zone. Each time zone has its specific times. For example, Eastern time can be 2 PM, central time will be 11 AM, and Western time will be 8 AM. As you can see, there is a three hour difference between each time zone. I am glad you are understanding how to blog so I hope you will keep on doing it. Tell everybody back in New York that I said hi. Tell Uncle Adam that I also said thank you and I hope that you will blog too and call me when he does. You should check out the baking post about our baking day. I love you! What a fabulous conversation you have going with your aunt! Read it with your parents, and then come back and let us know what you learned! As I've said in class, do not click on any advertisements! Looking forward to hearing what you learned! I am glad you got the chance to comment back to me. I ♥ that I am having a conversation with Aunt Stasia because her,my uncle, and my grandparents (my dad's side) all live in New York and I miss them very much. I can't look at the link you sent me but I will tomorrow. I am happy that my aunt is commenting. I have to go now so goodbye. I, too, am interested to know what you will report back with after you read the information on time zones that Mrs. Yollis provided in the link. It is interesting to me to see everyone on this blog and where they all come from. I am looking at the different information boxes on blog visitors in the sidebar. Do you know what a blog "sidebar" is? Which information box in the sidebar do you like best for showing how many people have visited this blog? I like those hearts around your name in your signature, and I would like to make some, too. Can you tell me how? I am so happy that you commented back to me. I have not looked at the link yet but I plan to over the weekend or whenever I can. I see you asked a few questions. You wanted me to find out what a sidebar is. A sidebar is a list of different people who comment. That is what I think at least. You also wanted to know how to do the hearts. First, Mrs.Yollis has a post on that at the top. Next, what I did was I copied the HTMLS (that is what we call the symbols) I wanted to use. Finally, I put it on the notes app on the computer. ( I had to press the add button in the north west corner because you can only save one thing at a time.) This is the way to do a heart (Don't do any spaces.)♥. The keys you have to use are: shift 7 = &, type hearts, and press the key after L ;. This is how it turns out:♥. Hope you have fun with your HTMLS! I think this is a very exciting idea and I am so happy to be a part of the November family blogging contest. This is a great opportunity for all the kids to improve on their communications skills, while having fun at the same time. I know it has been a wonderful learning experience for myself because it is the first year that I started blogging as well. I look forward to blogging all year and connecting with the children in your 3rd grade class. 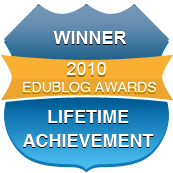 How many years have already gone by that you have been blogging with your students? I am thrilled to hear your positive response to Family Blogging Month! You are correct, it is a fabulous way to improve the reading and writing skills in an authentic and meaningful way. The project also helps everyone become master digital citizens. Skills like limiting personal information on the web, building a positive digital footprint, and making quality contributions to an online community are important new skills for everyone. Family Blogging Month offers a lot! You asked how long I have been blogging. I started the blog in 2008. You can look through old posts in the archive! Thanks, again, for being a part of our online learning community! I, too, am so excited that Family Blogging Month has begun! I have already been enjoying following this blog and the 365 Blog. Troy's grandmother in Wisconsin has also been commenting, and I think it would be neat if Troy's great-grandmother left a comment this month! I have also invited one of Troy's grandma's friends to join us on the blog. She is a retired teacher in Milwaukee and has heard a lot about our blog from Troy's grandma. As we know from our engaging interactions with Mrs. Ranney, retired teachers make excellent bloggers! We are also going to invite Troy's cousin Camilo to leave a blog comment. Troy and Camilo are only four days apart in age. Do you have a relative who is the very same age as you? A hearty thank you to you for your participation and for bringing in other family members so quickly! Everyone has enjoyed the photos and comments from your family and from Grandma Barb. I hope you are able to get Troy's great-grandmother to join our online learning community! Last year, we had a special blogger named Bubbe join our fun. She is 92! Here is a post about our first nonagenarian! Meet Bubbe! You asked if I have relatives who are my same age. I do not. However, I have a lot of cousins in Montana who are about fifteen years older than me. When I was young, it seemed like a lot of years. Now, we all seem the same age and enjoy being together when we can. Troy and his cousin are only four days apart! Do they get together each year for a combined birthday? I have seen the post about Bubbe before and think it is so wonderful that you have had such a diverse blogging community. Troy and his cousin were due to be born one day apart, but it ended up being four days. They were even born in the same hospital. When they were little they had their 1st and 3rd birthday parties together. However, now they live about 3 hours apart from each other. I can relate to what you say about your cousins in Montana. I have many, many cousins on my dad's side in Arizona. We are all different ages but get along very well as adults. Last month I met one of my sisters and two of my cousins for a little vacation. Do you ever pick a destination to meet your cousins for a vacation? 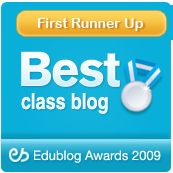 I think it is wonderful that the kids in your class are learning about the power of the blog. For example, Ruby's post on Hot Dog Charlie made him very recognizable this Halloween when we took him trick or treating. What a great way to share parts of your life and also learn about others at the same time. I read a few blogs but am not a regular contributor so learning to post meaningful comments and exchanging a learning dialogue is something I am looking forward to. I hope Ruby's dad and aunts will also start blogging because it's fun. How many years have you been blogging? Thank you for your kind words and for your numerous contributions to our Our 365 Project. 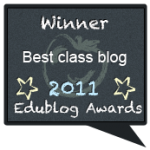 Yes, the blog really helps builds classroom community both in our room and in our actual community. I bet Charlie felt like he was a celebrity on Halloween! Everyone has stories to tell and knowledge to share. I find the blogs are a wonderful way to make learning available...always! I love the connections we make! You asked how long I have been blogging. I started in 2008 with my first group of bloggers. It has been a tremendous journey! My name is Kate and I am a pseudo-aunt to Ella. I have been a teacher 20 years and am currently an assistant principal in Las Vegas, Nevada. Ella and her mom invited me to review your blog and posts. This is such an awesome way to extend and differentiate the writing curriculum! In addition, I would love to extend the offer to connect one of my 3rd grade classes and possibly blog with our students. Again, thanks for letting me view this unique site! I look forward to working with you, if you wish! Welcome to our blog! 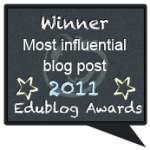 I agree that blogging is a fabulous way to extend and differentiate the curriculum. It has a lot of other benefits too. The primary benefits are for quality reading and writing development. As you know, quality writing practice strengthens those skills. Students love communicating with one another and want to get published. Because we set a high standard for the writing, they rise up to meet it! I love it! We have blogging buddies from all over the world and are always looking for new connections. Thanks! Family blogging month is so exciting. I remember when Royce was in the contest three years ago. He tried very hard to win. There are so many exciting things to blog about in the next few weeks: Book Fair, Thanksgiving and winter holiday plans. I love Family Blogging Month! It is so enjoyable to read people's comments and learn from then. It is a real gathering place for all of us! Although I do give awards, I feel like we all win because our community is stronger. I love the waterfall photo on your avatar. Is that from Yosemite? I still remember the time in second and third grade where the whole class commented feverishly. In second grade, I won first place, but in third grade, I was beaten by Bryce. I wonder who will win this year! By the way, my name is Heather, and I was in Mrs. Yollis' class in second and in third grade. Currently, I am nine years old in fourth grade. I have an adorable golden retriever dog named Rocky, who is two years old. I also have one elder brother, Aaron, who is twelve and in seventh grade. Family Blogging Month is a brilliant way to bring families together and to have some new bloggers to have a chance to contribute. Everybody has fun trying to beat other competitors while they can improve their reading and writing skills greatly. This way is a well-thought out way to urge others to blog, like me. I would always comment in the comment section, but in the section where Family Blogging Month took place, I was filling the pages with comments! Is there going to be another Family Blogging Month in April? I usually try to only persuade my mom, my dad, and my brother to comment because they are the only ones who know English fairly well. My grandparents don't know English that much, but I'm still working with them to improve their English. My aunt, my uncle, and my cousin live far away, but I still called them to see if they wanted to comment, and they said they would if they had time. My mom ended up commenting about twenty, I commented about one hundred, and my brother commented one. What do you like most about Family Blogging Month? When I launched Family Blogging Month (a little late due to a rough patch of food poisoning) I shared your story and video. In fact, we watch your Doggy Disobedient video more than once! You mentioned that you are trying to help your grandparents learn English. How are they doing? How is your Chinese coming along? Can you write in Chinese? Please feel free to comment back to anyone on this blog or on our 365. You are such a wonderful commenter and you know you are always invited! I am Troy's Grandma from Wisconsin. I have been following your classroom blogs since the start of the school year. I want to congratulate you on teaching your students such valuable writing and social skills in such an enjoyable format. What I like most about our digital world is the way it connects us regardless of our geographical location. We can learn about what makes us alike and celebrate what makes us different and interesting. I especially appreciate your emphasis on guiding your class to become safe and respectful digital citizens. I truly enjoyed the many blog posts on Family Traditions. It was fascinating and I learned a lot. If anyone reading this post has not had an opportunity to read the posts on that blog, I highly recommend you do so! I look forward to doing more blogging during Family Blogging Month and getting my Mom, Troy's 86 year old great-grandma, involved, too. By the way, I think your student's are brilliant! I am one of Barb's friends from Wisconsin. Barb invited me by email to participate in Family Blogging Month, and I am so glad to be a part of this fantastic project! I agree with Barb about the importance of safety and respect while blogging. What a super way for you to learn about so many topics in a safe way from so many different people! The university where I teach recently conducted a national general faculty meeting online over a period of three days. Teachers across the United States accessed the readings that were posted, watched videos, and carried on threaded conversations about how to better connect with students and make learning relevant. You are practicing this every day with your blog. What do you think I mean when I say relevant? Thank you for joining our blogging fun! Your recent experience with the online faculty meeting must have been very interesting. Do you feel that you were able to learn all you needed to without meeting your fellow teachers face to face? I know you teach college students, but did you learn any techniques that might be helpful for third grade math students? For the online National General Faculty meeting, participants were divided into groups of 40 led by a facilitator, which cut down on the amount of posts to read. Otherwise, it would be too overwhelming and too difficult to manage. Besides the readings and videos, it was a great way to learn from each other, without having to battle to be heard. My group had faculty from 20 different states (for those who made their profile visible), including two faculty members from California. I did not learn anything specific to math at this general meeting; whereas, during a Content Area Meeting I always pick up great math tips. However, something that might interest Troy's classmates is how the 24 time zones can be thought of as 12 positive numbers east of Greenwich, England and 12 negative numbers to the west. Since Greenwich is the center of the time zones (GMT), what value would it be assigned? I am not a family member but I do love this challenge! Mrs Yollis has such great ideas and I have done Family Blogging Month for the past few years with my students. This year, we had August is Family Blogging Month. Eevie from 4B won the challenge. I'm sure you will all enjoy sharing your blogging knowledge with all of your families and friends. Good luck! I always enjoy working with you and creating projects together. Thanks for you kind words about Family Blogging Month. Like you, I love making our blog a community of learners! We have had so many comments, I have not been able to keep up and comment back as much. Luckily the parents and kids are taking over. Love it! I commend you for your efforts int stimulating your students to develop an interest in writing. When I was in middle school (we called it "junior high" back then) I was not very good at writing. One of my older brothers, who was an english major in college, and went on to be a writer and editor, sat me down and taught me how to write. I'd write, and he would review. He gave me the best tip on how to write. He said that the best way to learn how to write is to write. Write about anything, just write. I wish all your students great success and enjoyment in their writing. It looks like you are already off to a fine start with Family Blogging Month! It is always fun to read the comments from all the students' family members and friends. I love to see all the involvement from the different age groups and locations and read about everyone's various experiences. Ty and I have discussed the blog on numerous occasions with our family and friends and everyone is so interested, excited and supportive of it. However, most of them have never blogged before other than a comment or two they left on Jenna's behalf a couple of years ago. Even then, most had to send me emails which I then cut and paste into the blog. Most of our relatives are a tad on the older side thanks to me waiting so long to have kids! It is challenging to teach them "new tricks". :) For example, Ty's grandpa is getting ready to celebrate his 94th birthday in January! We will, however, help grandpa leave a comment for sure. I'm looking forward to reading the blog this month. Thanksgiving is a perfect time to bring all the family members into the class. I forgot to ask a couple of questions. Ty's grandpa was born January 27th. Can anyone figure out what year he was born if he will be 94 in January? Also, does anyone here have a grandpa older than Ty's? If so, how old? My aunt (Ty's grand aunt) is 98! Nicholas and I figured out that your dad was born in 1921. He is a few years older than my dad Tom who has already written a post on the Veteran's Day blog. This year my dad celebrated his 90th birthday by taking his friends and family to Taix on Sunset. It was a memorable celebration! I look forward to reading more fascinating posts! Do you know what year Tom was born if he turned 90 this year? Ruby's great-grandmother is 102 years old and will be 103 next spring. We were lucky enough to visit her 2 years ago in Taiwan for a big 100 year birthday celebration. She still walks on her own amazingly. I wonder if her diet of rice and mainly vegetables has contributed to her longevity? This is Ty's dad, Richard. I have to say that 102 is quite impressive! I would also say that the rice and vegetables is probably helpful for longevity, but then again I know that Ty's grandpa lives on a potato chip and icecream diet . . . go figure. Ty: is daddy exaggerating a little bit? I was so excited when Ella asked if we would add some posts to your blog for November Blogging Month. Mallory fondly remembers writing her own blog when she was in Mrs. Yollis' class two years ago. It sounds like you are all having as much fun as she did! I have really enjoyed reading so many different comments from many of Sean's (Mallory's brother) friends too. He's in Mrs. Wilson's class. I'm curious, children in Mrs. Yollis' class, what do you like most about blogging? Is there anything that you find challenging about the blogging experience? One of Mallory's favorite things about blogging was chatting with so many interesting people from around the world. Would anyone like to share a story about someone you've gotten to know from another country or state? Wishing everyone a wonderful year full of blogging bliss!! Hello Mrs. Yollis' class. I am Troy's 7-year-old little brother. My name is Nolan. I was surprised when I noticed that you're letting little brothers and sisters blog too. It is very fun. My class is Mrs. Levy's class and we do blogging, too. I like blogging. Here's one question. What's it like to be in third grade? Here's question #2. If any of you have any pets, please tell me what kind of animals they are and what their names are. Question #3: Did I do a good job ending this comment? I am impressed by your questions and comments. I can't wait to see who will answer. 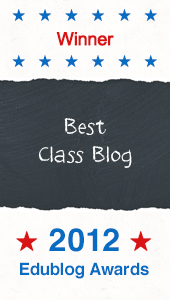 Did you see that we have a new blog post on our class blog too? I'd like to answer Nolan's question #2. We have a one year old rambunctious golden retriever named Bentley at our house. He needs lots of exercise to calm him down, so he gets three walks nearly every day. Bentley is very cuddly and an all around terrific pet. In the news today, I saw that a Great Dane named Snowy had a litter of 19 pups! Do you know what the record is for the largest litter of puppies? Thank you for participating in Family Blogging Month! Troy and I just looked up the answer to your question together on the internet. We learned that a litter of 24 puppies was born to a mastiff in the United Kingdom. However, not all of the pups survived. We do not have a dog, but this week we got to spend lots of time with my sister's pup. My parents were dogsitting her for a week. Troy and his siblings were so excited to spend time with her that they asked to go to my mom and dad's house every day! Sometimes they were surprised when the pup would come right to me, and we wondered if maybe it was because my voice is so similar to my sister's (her owner's). Do you think that is a possibility? We have two pets in our household, a dog and a parrot. Our dog is a Great Pyrenees. He weighs over 100 Pounds and is covered in long white hair. We say that he looks like a moving snowstorm. His favorite snack is anything that you're eating! Our parrot is also all white, with a crest of yellow feathers on top of her head. She is a sulfur crested cockatoo. She talks all the time, and will say "hello" when the phone rings. Her favorite snack is cheese. One interesting thing about our dog is that his birthday is a week before Aryana's birthday! Our pets can do a few tricks. I will tell you about that next time. I would like to know if any of your pets can do tricks? You and Troy are correct about the litter of 24 puppies! Isn't the Internet amazing? It is so great to be blogging with you. I was so happy to meet you when you were pregnant with Troy and came to Wisconsin for your baby shower put on by the soon-to-be Grandma Barb. I hosted Thanksgiving this year, and we had a wonderful time eating, watching football, and playing cards and board games. My mother was able to join us on Thanksgiving Day. The kids and grand-kids sledded and tubed in our backyard on Friday, and we celebrated my mom's 90th birthday on Sunday. It was a fun-filled weekend capped off by great football games played by the Wisconsin Badgers on Saturday and the Green Bay Packers on Sunday. Did you play any sports as a child? Do you play any sports now? Your Thanksgiving sounds very nice. We ate, watched football, played with my sister's dog, and played a Thanksgiving themed Bingo game. We were all very impressed at dinner when Troy's 4-year-old sister explained the journey of the pilgrims to us based on what she had learned in preschool. It was very cute...and accurate! I did not play any sports when I was younger. I had a lot of other interests including dance, art, drama, Girl Scouts, and eventually yearbook in high school. However, I enjoy watching sports now that I am an adult. When I was in college, one of my new friends took the time to explain football to me while we were at a game, and that really helped me to follow along and learn to enjoy watching football. I hope you will continue being a part of our blogging community even after Family Blogging Month is over! I'm so happy you have joined in the family blogging fun! I have read your posts on Mrs. Levy's class blog. You are a good writer with good ideas to share. I'll leave it up to Troy and his classmates to answer Question #1 but I would like to tell you about the one and only pet I had when I was a kid. One Easter, I went to the pet store and picked out the cutest, fluffiest, yellow duckling. My duckling fit in the palm of my hand. My duckling was a good eater and soon grew to be a large, white, quacking duck. Eventually, I had to take my duck to a duck farm to be with other ducks because city living was not a great place to raise a duck. In answer to Question #3, I think you did a great job ending your comment. If you could have a pet, what would you choose? What would you name your pet? I am Troy's aunt. I am the oldest sister of Troy's Mom. What a fun class project you have going on here. I actually wrote a nice post yesterday, but something happened and now I do not see it. I will try again. Sometimes technology frustrates me, but when I get frustrated, I just try again. I have many wonderful nieces and nephews, but the special thing about Troy is that he is only 4 days older than my first son. That means Troy's Mom and I were pregnant at the same time. The boys were even born at the same hospital! It was an awesome experience to be pregnant at the same time as my sister and it was great to become first-time mothers together. Our sons are extremely close with each other, even though we no longer live around the corner from Troy and his family. Today we live about 3 hours north of your school. We live in a small town that is right in the middle of two big cities: San Francisco and Los Angeles. Now we have two boys, ages 8 (3rd grade) and 5 (kindergarten). My son is learning to use computers in his third grade classroom and he is also learning the proper way to type. In addition, my son's classroom is currently rehearsing a musical play about the solar system that they will perform for parents in December! I know my son, Troy's cousin, would like to comment on this blog. I am sure he would like to tell you more about his very special school. In our town, I run a small business with my husband. We are both lawyers. That means we get to help a lot of people solve their problems. We mostly help workers (also called employees) who need help with problems at work. Some people work very hard at their jobs, but they are not treated kindly by their bosses (also called employers). That makes me very sad. How would you feel if you worked very hard every day, but didn't get paid for your work? What if you got very sick and had to take some time off from work, but your boss would not let you? These are the kinds of problems we help fix. Our country and our state have laws that protect workers because everybody needs to be treated fairly. I am wondering if any of you have thoughts about what you might like to do for a job when you grow up. For me, it was important that I find a job where I could help people. What is important to you when you think about your future? I am Camilo, Troy's cousin. I live about three hours away from Troy. I go to a language immersion school. That means, I learn two languages: English and Spanish. We learn language arts (reading and writing) in our home language, but we learn science, math, and social studies in both English and Spanish. For example, one day we learn a math concept in English and the next day we continue with the same math concept in Spanish. Another example is that I know all about the solar system and the phases of the moon using both English and Spanish vocabulary! In fourth grade I will begin learning to read in my second language. By the time I go to middle school I will be bilingual! My brother is in kindergarten and he goes to the same school. In school my favorite subject is math. I also love to read. I especially like when the older kids at my school get to help the younger kids read. For example, one time my third grade class got to go to the kindergarten class and read to them. I got to read with my brother! My favorite sport is soccer. I play soccer at school with friends and my favorite position is goalie. What sports do you play at school? I am Ruth, Troy's Great Grandma from Wisconsin. I heard about the blog from my daughter, Barb, and it sounded very interesting. I can see why the children are so interested in this because they get to hear from lots of different people and learn new things from them. I look forward to reading some of the posts and looking at the photos. I always look forward to my great-granchildren coming to visit me during their summer vacation. Now we will have even more things to talk about. I think you did an excellent job ending that comment. In third grade you will learn a lot of new things like multiplication, fractions and grammar (new words and how to write better). I would like to leave a comment on your class blog, too. Thanks for commenting. I still haven't decided yet what I want to be when I grow up. Something that is important to me for my future is to own a pet one day. Can you teach our class a couple of words in Spanish? At my school I like to play two touch football. My class also does reading with younger kids who are in the class that comes before Kindergarten. It is called Journeys. Thank you for commenting. I wrote back to you on the Veterans Day post. I think it is very cool that you commented. I'm Nic's grandma, Bonnie. Nic and his sister, Layla, call me "Mama" because when Nic was learning to talk, he heard his daddy call me by that name. For a short while I tried, in vain, to get Nic to call me "grandma", but he knew what he liked. When Layla started to talk, she heard Nic call me "Mama" and that is her name for me as well. Of course, now I love being called "Mama" because it is unique, just like my two very special and adored grandchildren. 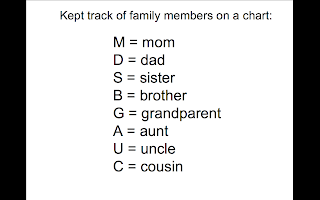 I feel like it is a nickname, and I wondered if any of you have a nickname or a special name for your grandparents. Thanks to everyone who has helped and encouraged me to blog. This old "mama" is getting younger by the minute! Hi Mrs. Yollis! Hi Mrs. Yollis' class! I am Aryana's grandmother and I have never written a blog before. I'm glad you are asking friends and family to blog so I can learn from Aryana how to blog. I'll write about my interests and activities regularly. Have a good day. Pearl (Aryana's grandmother.). Hi everyone! What a treat to be able to write a note to Mrs. Yollis' class! I am Sam's Grandfather . He is very lucky to have two of them. I live in Pittsburgh, Pennsylvania...pretty far away from your community. I would like to wish you all a very happy Thanksgiving! You all are very fortunate to have such a wonderful teacher as Mrs. Yollis. I wish I could go back to school again! I hope I am doing this blog correctly. Hi --- I am Sam's Grandma. This blog is a great idea and I hope the class has a lot of fun with it. Hey, all you third graders, here’s a short little brain teaser. See if you can identify how many words are misspeled in this short blog. You have to remember to look carefully at what you write, because sometimes your brain sees what it thinks shoud be there and not what is actualy written. What you say when you’re telling your story is importent, but you have to read what you’ve written and pay attentian to details. Here’s a double clue: five words are misspelled. Do you know why it’s a “double” clue? Have a great day. What it is, Mrs. Yollis's class! Good evening, Mrs. Yollis's class! What has 4 legs in the morning, 2 legs at noon, and 3 legs in the evening, and no legs at midnight? If you were in ancient Egypt you would need to solve that in order to go to the afterlife. when you are a baby you crawl on you two hands and two feet. When you are middle aged you walk on your two feet. When you are old you have your two legs and a cane. The final one is where you are at the end of your life. Is my answer right? 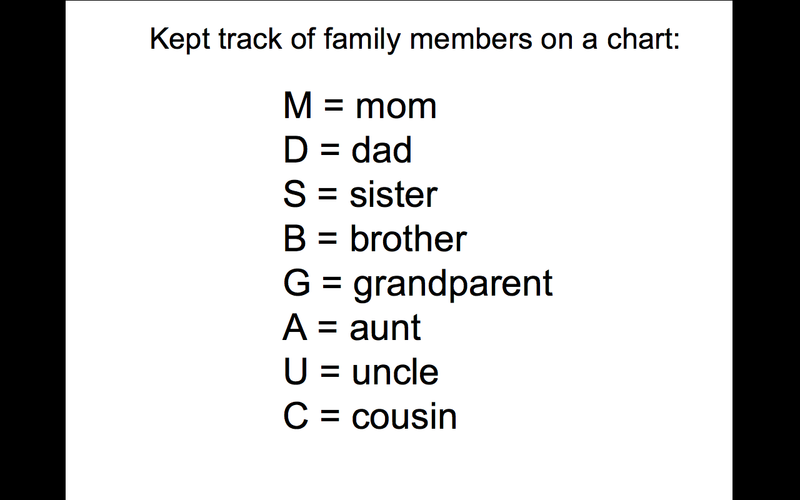 My dad is greek and he told me the riddle. He said if you answer it wrong you would get killed by a creature. If you answer it right the creature gets killed. I hope I am right! I can remember what the creature is called. It is called the Sphinx. I don't know if that is what you are talking about though. I said that because my dad told me the riddle and he said that the Sphinx is the creature that would eat you. That is a little information that I got from my dad. I hope you get the chance to comment back! I know about the riddle of the Sphinx, too! I love to learn about mythology and history of the ancient world, and the Sphinx and her riddle is one of the oldest and scariest myths. I saw a Sphinx carved in stone on a wall in the museum in New York, and I have also seen the Sphinx sitting outside the front entrance of old buildings. Sometimes they are in pairs on either side of the front door. The Sphinx is a girl! How about that! She has the body of a lioness, which is very ferocious, and that's why she is used to guard the front of buildings. Have you every been to a building with a Sphinx in front of it? I am glad you commented on the blog! I had no idea the Sphinx was a girl. That is very strange. I have never seen a Sphinx outside of a building but I have heard that there are lions outside of buildings. I never knew it was the Sphinx. Thank you for telling me those facts about the Sphinx. I think that the riddle of this creature is very interesting. I got to go now so bye! I am so impressed with this classroom blog and how so many family members are participating. Everyone has written great blog posts. Blogs didn’t exist when I was in third grade. The first personal computers were just coming out for people to purchase. Typing with proper grammar is an important skill to have and blogging is a great way to learn that. Speaking of computers, do you know which popular company built its first computers in a garage in Los Altos, California in 1976? I’ll give you a hint: you may be using one of their computers to read this blog post. I am actually using one of their computers to do all of my blog posts. It is my favorite computer company. I would like to add another hint: this computer company is named after a very delicious piece of fruit. When I grew up, we didn't have computers either and we didn't have the Internet. It is hard to imagine going to school these days without using the Internet to learn new things. I think I know what computer company started in a garage in 1976 because I am using one of their computers right now! They also make very popular phones that can run apps to do all kinds of amazing things. Now does everybody know what computer company we are talking about? I think the company of the computer is called Apple. Am I right? In fact, that is the company of the computer that I used to type this comment. Troy asked me if I would teach you some words in Spanish because I go to a language immersion school where we learn English and Spanish. Here is how you say "Hello Third Grade:" Hola Tercer Grado. Here is how you say "Thanksgiving;" Dia de las Gracias. Can you guess the English translations of these planets? P.S. @Troy: I love playing two-touch also! Thank you for teaching us some Spanish words. Here are some directions for making an accent over the letter 'o' in Plutón (if you are using a Mac laptop). Hold down the 'o' key until it gives you a bunch of options. Keep holding down 'o' and type the number of the option that you need while still holding down the 'o' key. It was good to see you last week when your family came through our area. Did you have a nice trip? This is Norway calling - your grandma is on line to give a comment to your class-blog. I think it is interesting to see what you learn in school. We have no winter yet, but we are hoping for snow at x-mas. Today I have been visiting your two cousins, and they say hello. Now they just went to bed. Give my love to your class and your family. I am Winstons godfather from Norway. We are 9 hours ahead of you and as such your day has not yet started. I would like to wish Winston, his family and the class a happy Thanksgiving (even if we do not celebrate Thnaksgiving in Norway). How nice of you to do a blog post all the way from Norway! I think that is what I like most about blogging and the technology we have available today - it connects us no matter how far apart we may live. You mentioned you do not celebrate Thanksgiving in Norway. Can any of Mrs. Yollis' students figure out why Thanksgiving would not be celebrated in Norway? HINT: Think about the Brain Pop video on the Compound Sentence Blog that explained why we celebrate Thanksgiving. Could Winston's Godfather, or anyone else familiar with Norway, tell us about a holiday Norwegians celebrate that is unique to Norway or perhaps one that we all share? I thought that I was very far away from Mrs. Yollis and her classroom because I live on the east coast of the United States. I think that you live farther away from their school that I do, and that you are in a different time zone. Can anyone help me to figure out how many miles it is from Winston's family in Norway to your classroom? Hello Grandma, hello Godfather. Thanks for contributing to the class blog. To answer Anastasia's question, the distance from Winston's family in Norway to the classroom at Chaparral is 5,312 miles, as the crow flies. That's a loooong way from here! Thank you for your reply. My favorite part of Thanksgiving dinner is the pumpkin pie. But, unfortunately, we finished it a few days ago, and it was delicious. I don't want to wait a whole year to eat it again, so, I am making a new pumpkin pie today for dessert. I can hardly wait until dinner! What is your favorite food from your Thanksgiving celebration? I am Aryana's YiaYia, which is Greek for Grandmother. I am Greek-Canadian. I live in a city in Upstate New York, on one of the five Great Lakes. Do you know the names of the Great Lakes? Lake Ontario, Lake Erie, Lake Superior, Lake Michigan, and Lake Huron. I had a little help from your sun who happens to be my dad :). By the way, Family Blogging Month is ending on December 5, 2014. This has been a fun experience so far. I am looking out the window at the snow falling right now. I can still see the grass, but it's 40 degrees, Brrr. How was your Thanksgiving? We all went to a big family party at Aunt Thalia's house, and then Aunt Stasia made anothe turkey over the weekend so we would have leftovers! My favorite part of the dinner is the stuffing. Do you know why we celebrate both American and Canadian Thanksgivings here? Do you know when Canadian Thanksgiving is? P.S. What does "mou" mean next to your name? I am glad you commented. 40 degrees is very cold.My Thanksgiving was very nice. Was your Thanksgiving nice? I can't believe Aunt Stasia made another turkey! My favorite part of the dinner was the turkey, the crescent rolls, and the corn muffins. Mou is a greek term of endearment. I also know why you celebrate both Thanksgivings. You celebrate them because you are Canadian and American. Canadian Thanksgiving is on American Columbus Day, so now I can get why you made two turkeys. I hope everyone had a fabulous Thanksgiving.This year I celebrated my 80th birthday up in Seattle on Thanksgiving, with my Family and friends. It is very cold and it is snowing here. stay warm and dry. P.S. this is my first time blogging! Thank you for comenting on our blog! How was your birthday? I hope you are having a fun time. can't wait to see you soon. First of all, I wanted to congratulate Mrs. Yollis' class for doing such a wonderful job. When Kiano asked me to write a comment here I was super excited. I usually get excited because Thanksgiving is the start of a fun and memorable holiday season, leading into many more celebrations. So the more fun my Thanksgiving is, the more fun I will have when all the other holidays arrive. As many of you may know, the day after Thanksgiving is called Black Friday. Does anyone know why it's called "Black Friday"? I have an answer for you. "Black Friday" is the day that people start their christmas shopping. The stores start making profit moving from "Red"(not making profit) to "Black"(making profit). I hope everyone had a great break. When Kiano told me to write a comment I started thinking about how much everything has changed since I was in 3rd grade. Its really great that you guys get to live in this time period, best time to live in my opinion. Even though sometimes school seems a little hard enjoy every single minute of it because time flies and you will miss these days! Hope you guys have a great year, and have fun blogging! I really like the idea of writing comments on this blog. 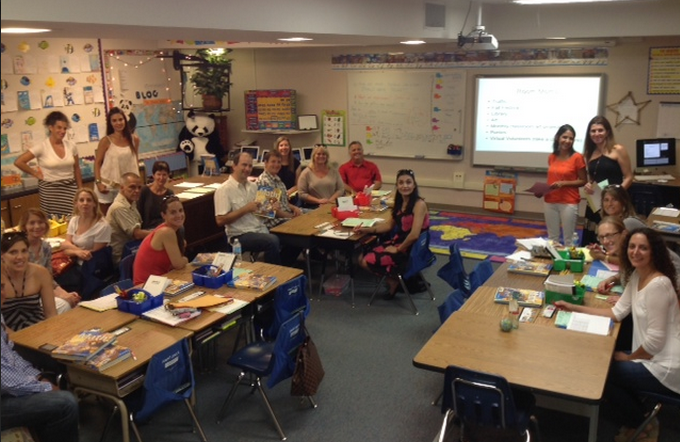 I believe that it helps the family of students to get familiar with the new methods of teaching and learning. When I was at third grade, I couldn't even imagine some day students will use a device like tablet or computer to do their homework! Happy blogging and wish you all the best. I am Tiffany Kiano's friend, I am half Puerto Rican and half Caucasian. My family is originally from Puerto Rico. The island is also popularly known in Spanish as la isla del encanto, meaning "the island of enchantment". which one of the following three do you think Puerto Rico falls under? I was looking forward to coming to school today but I was feeling a little bit under the weather so I stayed home! We moved from New Jersey to California last November and just before Thanksgiving. The main reason was to be close to the family but the cold winters of the east coast played a big role too. Two years ago Sandy hit the east coast and damaged a lot of buildings, roads and trees. It was so severe that we had to stay home for three days and many people had no power for one week. Once the storm passed and we were able to go out of our home, it was so sad to see so many broken trees almost everywhere. Even some of very old trees which survived many other storms, were broken. With the Sandy experience, now people on the east coast are much more prepared for natural disasters however, we all hope that we see less devastating storms like Sandy in the future. Last month we traveled to Australia. Australia is a country in the Southern hemisphere between the Pacific Ocean and the Indian Ocean. Australia is the sixth biggest country in the world by landmass. However it's population is only 23 million, which is less than the population of California. The fun part of our trip was to visit Brisbane’s Kuala Sanctuary which is the largest in the world. Kuala’s are among the laziest animals in the world. They sleep 18 hours a day and even when they are awake they are not very active and do not move that much. There was a photo stand in the park where people could hug kualas and take photos with them. But it was interesting that if the kuala didn’t like you, they could become very aggressive and even bite you. So the trainers let the them smell you first and if he/she liked you then they would let you hold them. This was my second time traveling to Australia and we had a fabulous time there. Does anyone know how long the flight is from Los Angeles to Brisbane? I'm so glad you enjoyed your trip to Australia, and in particular, the koalas! It's interesting that they can be so aggressive when they look so cute and cuddly. I'm originally from Sydney, and we will be traveling there this coming winter break to visit family. If I remember correctly, the flight from Los Angeles to Sydney is about 14-14.5 hours. So can anyone figure out if the flight from Los Angeles to Brisbane will be shorter or longer than this? And does anyone know any other animals that are only found in Australia? I'd also love to hear about animals that are indigenous to other countries. Banafsheh, I hope you get to go back to Australia again one day! my grandma, Yia Yia, Aunt Stasia, Uncle Adam, my dad, my grandpa,and my mom. I just want to thank them for their contributing. I hope everyone is having fun with the rest of Family Blogging Month. A Thanksgiving Tradition :: Pumpkin Bread! The Wonderful World of Weaving! How To Write a Compound Sentence!